The Hochelaga-Maisonneuve district of Montreal may not be the first place that comes to mind when searching for a beautiful place to share a coffee with a friend or relax while studying. However, amidst the bustle of Ontario St., a welcoming spot has recently opened. 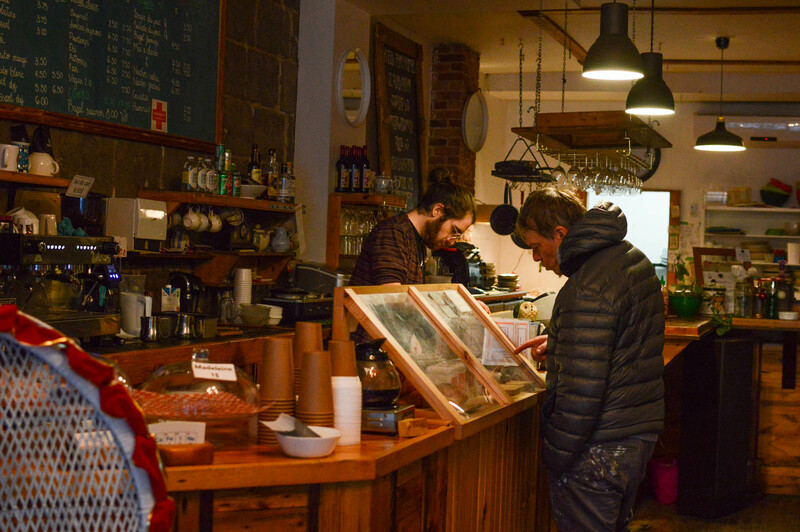 On the outside, the small entrance of what looks like an old residential building may go unnoticed, but inside, there is an unusual coffee shop that’s quickly becoming one of Hochelaga’s hidden gems. Coopérative Rond-Point is a self-run, non-hierarchical coffee shop that opened during summer 2017, where every decision is taken democratically by all staff members. For Héloïse Lanouette, one of the three founders of Rond-Point, the idea of creating a cooperative of workers came naturally. The first thing that attracts attention when entering the place is the vibrant atmosphere—regular customers talking to the staff by the counter, university students preparing for their finals, a group of friends catching up during brunch. Most walls are covered by the work of local artists and posters of future shows, and there is even a piano at the entrance, which was a gift from the previous owner. Coopérative Rond-Point is a self-run, non-hierarchical coffee shop and community space. Photo by Mackenzie Lad. The shop stands out for its inclusivity and its accessibility for people of different ages and economic backgrounds. The same energy not only comes from the clients, but from the staff as well. The new members of the team have the same power and responsibilities as the founders do. One of the missions of the shop is to work with the community. It offers visibility for small artists and organizes weekly free events including poetry readings, comedy shows and movie screenings, that contribute to creating a social presence. Just recently, Rond-Point became the home of the Ligue d’Improvisation des Pas Sages (LIPS), an improvisation group that now puts on a show at the coop every other Thursday.